One of my favorite treats at Disneyland Resort can be found at the Mary Poppins-inspired restaurant at the end of Main Street, USA : Matterhorn Macaroons! These are delicious macaroon cookies that are in the shape of the Matterhorn ride, topped with white glaze to look like the iconic snow-topped mountain. I wanted to have a gluten-free, better-for-you copycat recipe on hand. 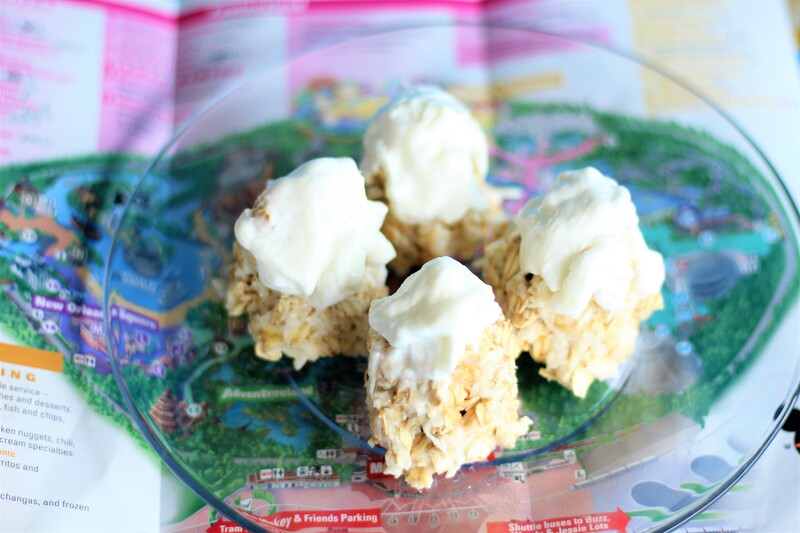 My Matterhorn Macaroon cookies are also great as energy bites! Mix oats, coconut flakes, cream cheese, maple syrup, and vanilla together in a bowl. Rub your hands with oil, and then roll your batter into mountain-peak-shaped cookies. Then, remove from freezer and top with a dollop of Greek yogurt to look like snow. Place back in the freezer for 10 minutes. Either eat immediately or place in refrigerator until ready to eat.